Want to learn how to Crush It? 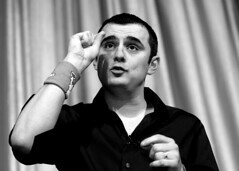 Web 2.0 guru and now best-selling author Gary Vaynerchuk will be holding court at the Bell House in Brooklyn on October 27th, starting at 9pm, for an exclusive FREE event. RSVP on the Eventbrite page – and make sure you get their early to secure your spot! The place is filling up quickly. Gary will be joined by a guest that night for a very special announcement, and the evening will feature an exclusive montage of never-before-seen, behind-the-scenes video footage. An after party with Clabo, who brought you the Crush it! music video, will top off the evening. UPDATE: Want to hang out and drink champagne with Gary V. backstage before his presentation at the Bell House on October 27th? Just reserve a spot on the Eventbrite page and then get two of your friends to reserve tickets as well. Send all three of your confirmation codes to garyvbellhouse@gmail.com and they’ll draw one email as the winner. The winner and his or her two friends will then get to go backstage before the show and spend time CRUSHING IT! one on one with Gary V!